Now don’t panic when you read the heading as most pickles and preserves are very easy to make. If you can chop, stir and boil a kettle you can make these recipes. When I was little I used to help my Nana make piccalilli, apricot jam and green tomato pickle. I would have an apron on and be on the stool so I could see what was happening. When I got older I would do some of the peeling and chopping. 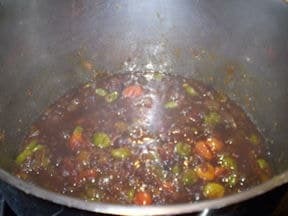 For both the piccalilli and green tomato pickle all you have to do is chop the ingredients mix them together in a large saucepan, bring to the boil, reduce the heat and stir occasionally. When nearing the end you might have to stir a bit more often, but as you will be sterilizing your jars – don’t panic it only requires boiling the kettle – you will already be in the kitchen, so a bit of extra stirring isn’t too hard. Now for the jars I usually save ones with metal lids, honey and jam jars are good. I rinse them well, then wash them in the dish washer, storing them in a cupboard with the lids off, to stop any mold if they aren’t completely dry. Now cut the lemon into quarters BUT don’t cut all the way through to the bottom. Press into the center of the lemon rock salt approx a heaped dessertspoon. Squash the lemon closed, and place into the jar, continue ensuring that the lemons are jammed into the jar. If using extra flavorings place them in the jar as you fill it. Cover with lemon juice, screw on a lid and place in a dark place i.e. the back of a cupboard. Leave for 1 month before using. See isn’t that easy, a bit of cutting, squashing and juicing. NOTE you may get a white mold on the top of the lemon, don’t worry this is harmless wash it of the lemons before using. 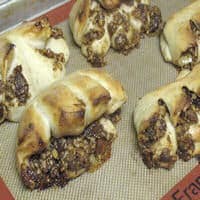 Now you will need to start this recipe the day before. In a large non reactive bowl layer the vegetables sprinkling the salt over the layers. Cover with a tea towel and leave overnight. Place vegetables with all other ingredients EXCEPT the flour, into a large pot. Bring to the boil, reduce heat simmer about 10 minutes until the vegetables are tender. Mix together the flour and extra vinegar, add to the mixture stir until liquid thickens. This can take 2 – 5 minutes. Now I have a wide necked funnel for bottling, but you can carefully ladle the mixture in. Empty the water from the jars one at a time fill to the top and screw on the lid, and then fill the next jar. Now you sterilize and fill the jars the same as for the Piccalilli. Place all ingredients into a large pot, bring to the boil. Cover, reduce heat, simmer stirring occasionally for 45 minutes – 1 hour until thickened, it may take longer. For the last 10 – 15 minutes you need to stir more often to ensure that it doesn’t stick to the bottom of the pan. You can do this as you are boiling the kettle to sterilize the jars. Makes about 2 litres. What’s your favorite pickle recipe? Tell us in comments!